Why does it rust so? Does it have a real purpose? I love these guys. Ganesh knows what this thing is, but he won't tell me, his vehicle: silent. 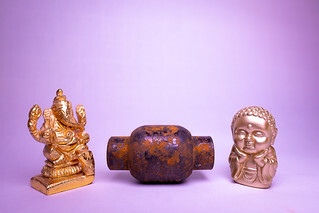 Buddha knows that there are many purposes for this item, and that it's one of mine to figure out what those are. Even if it's simply to be inserted into random photographs!